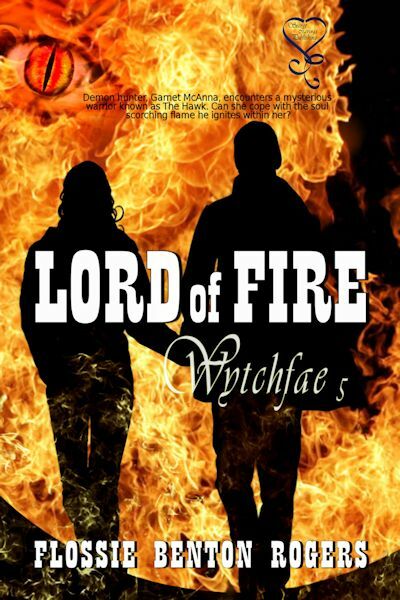 I’m pleased to welcome friend and sister author, Flossie Benton Rogers to my blog today with her latest release, LORD OF FIRE—WYTCHAE 5. If you haven’t read any of the titles in Flossie’s Wytchfae series yet, you’re missing a treat. These wonderful stories are full of magic, romance, mystery, and adventure. Here’s a closer look at Flossie’s latest, along with an intriguing excerpt, and a chance to win in Flossie’s Rafflecopter giveaway. When The Hawk meets his Wytchfae, the result is spontaneous combustion. Garnet McAnna chases the demon responsible for attacking and enslaving innocent fae familiars. She never expected to run headlong into a mesmerizing stranger known as The Hawk. Nor did she anticipate the way his masculine power kindles a womanly flame within her. Exiled from an elite warrior’s brigade, Lord of Fire Gabriel Hawk guards his heart and his solitude. He wants nothing to do with the world of men or the realm of fae. Then a beautiful Wytchfae bursts into his life, stirring desire and sparking need. Garnet is on a dangerous mission, and he can’t let her face the evil alone. What else can he do but fight beside her? When she disappears, he raises hell to find her. Will he be too late? Will darkness conquer this couple or will love burn their souls into one? First Line Teaser: She’d catch the demon tonight if it killed her. Lost in her thoughts, Garnet ran up against something hard and springy, and a sharp point pricked the soft flesh of her thumb. She squeezed off the pain with her other hand. She had already made it to the fence line and hadn’t even realized it. Sucking in a deep breath, she cleared her mind to concentrate on the task at hand. She had to edge around the boundary to the north side of this large piece of private property to gain access to the portal. Then she’d hunker down in the bushes and wait on the demon Borros. Moving swiftly again, she cut a wide swath away from the metal fence. Snorting sounds came from within one of the corrals she had noted early this morning when she skirted the property. Horses and a few cattle had grazed within. Bearing around the corner to head north toward the portal, a splash of incandescent green appeared and then disappeared in front of her. Startled, she blinked and reached into her coat pocket for the revolver. The weapon lay cold and substantial in her hand. She stilled her body to a midnight silence. The eerie green reappeared and dashed around her body without spotlighting her in any way. It formed a mysterious elongated glow. She clamped down harder on the gun handle to stop her hand from trembling, while shifting positions to keep the phenomenon in front of her. Her mind tumbled over possibilities. The light couldn’t be swamp gas, as it seemed to proceed purposefully. Its movement created a slight whirring sound. A will ’o the wisp? Somehow she thought not, but what was it? The presence darted behind her. Before she could turn, a warm, corporeal hand covered her own and relieved her of the weapon. Whirling around, she came face to face with—a man. A gasp escaped her lips. With his substantial height, he towered over her. A faint greenish residue of light illuminated him enough so that the fierce scowl on his face caused her heart to thump into overdrive. 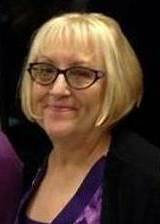 Flossie Benton Rogers is the author of the Wytchfae paranormal romance series. She is Sagittarius with a Libra ascendant and Taurus moon, or a 5th generation Floridian and freedom loving mystic. She pursues her passion for mythology by writing romances with fairies, goddesses, ghosts, angels, demons, and other magical beings. The Wytchfae world brims with dimensions parallel to our own. Some are welcoming, others dangerous and forbidding. Through the darkest night and the fright of unchained chaos, love will always shine. GIVEAWAY ALERT! CLICK TO ENTER!! This entry was posted in Author Spotlight, Fantasy, Paranormal, Romance and tagged Flossie Benton Rogers, Lord of Fire, Mae Clair, Wytchfae 5, Wytchfae Series by Mae Clair. Bookmark the permalink. Congratulations on such beautiful introduction and interview – Very enjoyable! Happy you dropped by to check out Flossie’s release! Lord of Fire offers the reader adventure, magic and a really gripping story-line! Read it for a bit of escapism! The well written story pulled me in from the beginning, as I have the pleasure of having read it. Mrs. Flossie Benton- Rogers is a gifted writer, a real magician with words. Carmen, you don’t know how much I appreciate your kind words! Thank you, and I’m so glad you enjoyed Lord of Fire. I had a blast with Garnet and Gabriel. I’ve read all of the other entries in this series and LORD OF FIRE is on my list. It sounds like I’m in for another great story! Thanks for visiting, Carmen! Mae, thank you for featuring Lord of Fire today. I really enjoyed writing the adventurous love story of Garnet and Gabriel. Glad to have you, Flossie. And I’m looking forward to reading their story! I can almost feel the heat coming from the book cover. That is quite a memorable line! I can’t wait to hit that scene, LOL. Thanks for visiting, Emma! Haha, it may singe you for sure. Thanks for commenting, Emma!